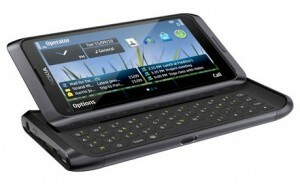 Nokia today announced Nokia E7, the first Eseries device with the Symbian^ 3 operating system. The Nokia E7 has a similar design of the Nokia N8, and the major external change is an additional sliding QWERTY keypad and the camera. The camera in Nokia E7 is 8MP auto focus with dual LED flash. The Nokia E7 has 4″ AMOLED capacitive touch screen display with multi-touch support. 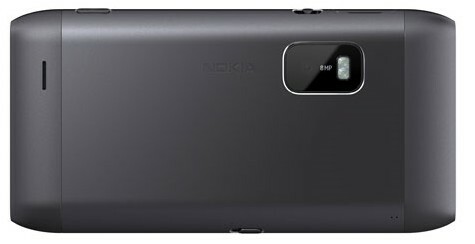 It comes with the Nokia ClearBlack technology for improved performance in low light conditions. E7 includes Microsoft Exchange ActiveSync and several other office productivity tools for the day-to-day needs of the professionals. Like the Nokia N8, it has the support the lest Bluetooth 3.0 and high speed network standards for better data transfer. Nokia E7 has all the features of Symbian ^3 OS, which includes better memory management, network speeds, HDMI connectivity, multiple home screens, hardware accelerated graphics, multi-touch and support for pinch-to-zoom actions in gallery and web pages. The Nokia E7 has polarized AMOLED screen, which is of capacitive touch technology. The AMOLED screen in E7 reduces the energy consumption of the phone, improves speed and color rendering. The 8MP camera in Nokia E7 has a dual LED flash, and it supports HD video recording at 720p. E7 is an ultimate business smartphone with Mail for Exchange, Microsoft Share Point server and SSL enabled VPN support. E7 includes industry standard encryption technologies for corporate communications. There is Microsoft Exchange ActiveSync for syncing contacts, calendars, notes and mail from Microsoft Exchange servers. Nokia E7 also includes F-secure Anti-theft, Quick Office, World traveler and other productivity software. The Nokia E7 is a super phone in all aspects. The disappointment is in the processor speed (ARM 11 680 MHz) and the inbuilt amount of RAM. However, the speed completely depends on the application performance, and the OS level memory management, which is usually good in a Nokia smartphone. Other features of Nokia E7 include social media connectivity, free navigation using OVI maps, Dolby Digital Sound, HDMI output, Micro USB 2.0 port, 16GB mass storage, 350MB internal memory, 256MB RAM, 1024 MB ROM, 3.5mm headphone jack, FM radio, Adobe Flash, music player, full web browser, WLAN, HSDPA/HSUPA and 1200 mAh battery. Nokia E7 will be available in five different colors Gery, Silver, White, Blue, Green and Orange. Nokia will launch the E7 business phone in 4th quarter of this year – for a suggested market price of 495 Euros. When converted with latest rates, Nokia E7 will cost around 30000 INR in India. That is a must have!! Actually,i was just waiting for the day,when E-7 will be available in store,but it’s cost is so high,if price of the phone is not more than 20000,then i shall go for it.